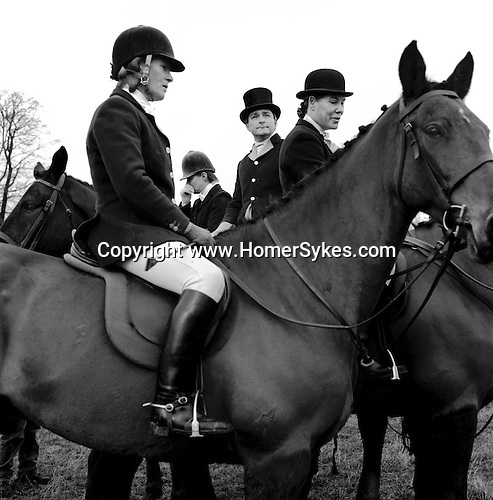 The Duke of Beaufort Hunt...The traditional Boxing Day Meet is held at Worcester Lodge, on the Badminton estate. It is usual for several hundred mounted followers and an equal number of foot followers to attend along with a TV crew or two, as well as a number of freelance photographers. Near Didmarton, Gloucestershire 2002...Hunting with Hounds / Mansion Editions (isbn 0-9542233-1-4) copyright Homer Sykes. +44 (0) 20-8542-7083. < www.mansioneditions.com >.